If you follow me on Instagram you may have seen my stories about adventuring through the new Trader Joes in New Orleans. I’m so excited to finally have a Trader Joes near by because they have so many “fun” foods and a decent amount of International ingredients at good prices. One ingredient that I spotted and had to try was harissa. 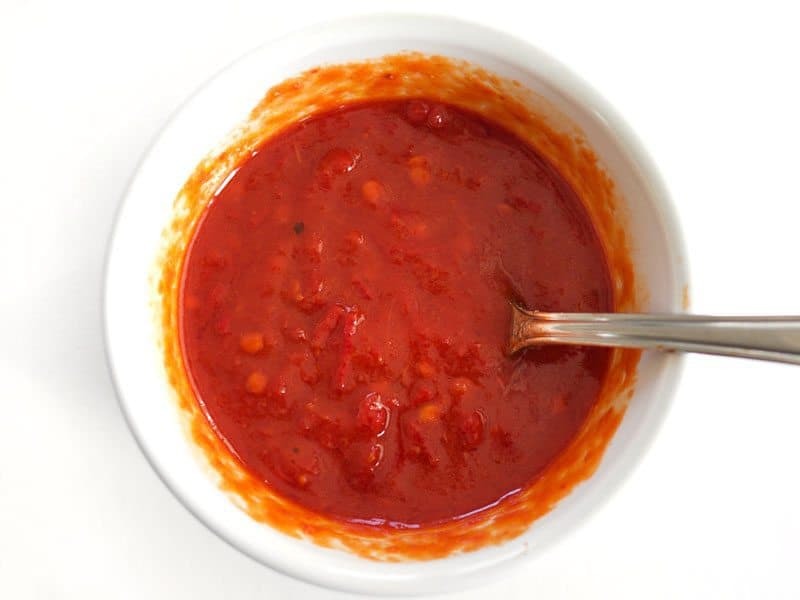 I’ve seen harissa in recipes a lot lately and have been super curious about it because, well, you know how I love spicy chile sauces! So, I grabbed a jar, mixed up a super simple marinade with lemon, honey, and olive oil, and made a big batch of crispy Harissa Roasted Vegetables. 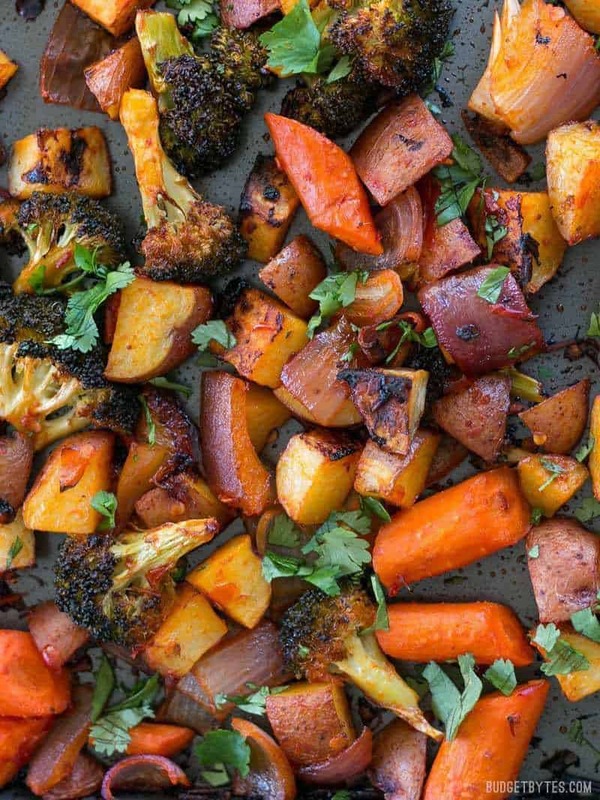 You can serve these smoky and spicy roasted vegetables as a side next to grilled meat or fish, or slap an egg on top (as I always do) and make a meal out of it. I also served my Harissa Roasted Vegetables with Cumin Rice, which made a nice earthy base for all those harissa flavors to pop! Love it! 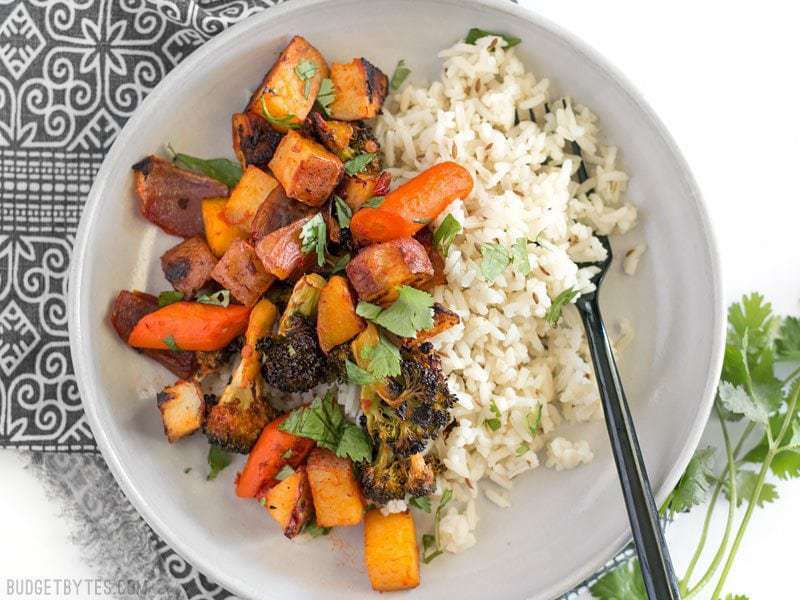 Harissa Roasted Vegetables are a spicy, slightly sweet, and smoky vegetable medley that makes a great side for meat or fish. Preheat the oven to 400ºF. Prepare a large baking sheet by lightly spritzing with non-stick spray or covering with foil. In a small dish, stir together the harissa, olive oil, honey, salt, and lemon juice. Set the marinade aside. Wash the potatoes well and cut into one-inch cubes. Wash and peel the carrots, then slice into one-inch sections. Cut the broccoli into florets, and chop the onion into large sections. 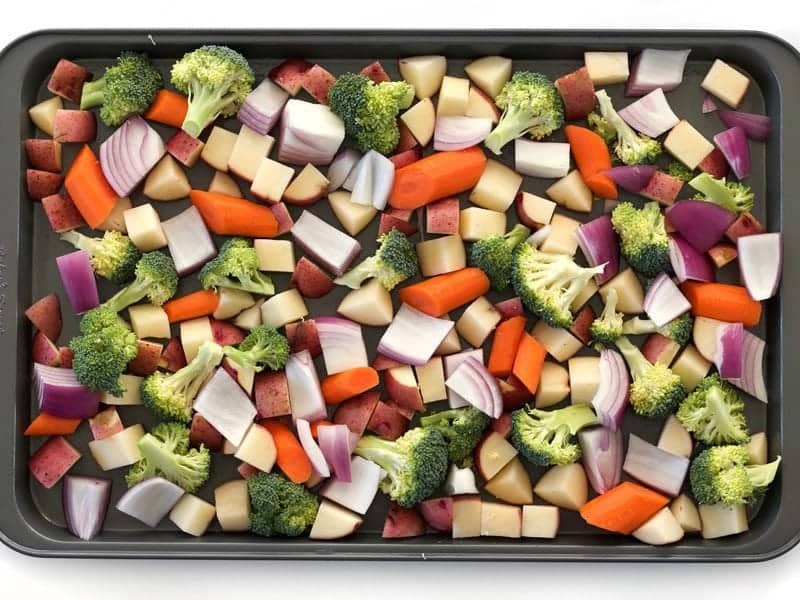 Place the potatoes, carrots, broccoli, and onion on the prepared baking sheet. Pour the harissa marinade over the vegetables and use your hands to toss the vegetables until they are evenly coated in the marinade. 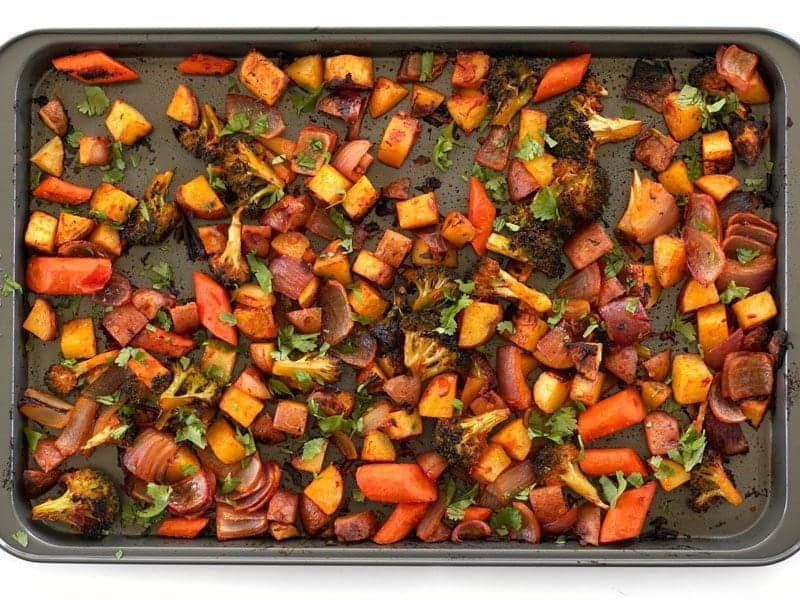 Roast the vegetables in the preheated oven for 30 minutes, stir, and then continue roasting for another 10 minutes, or until the vegetables are tender and the edges have achieved a nice deep brown color. Top with chopped cilantro just before serving. Tried this recipe?Mention @budgetbytes or tag #budgetbytes on Instagram! This is the harissa that I used. It comes in a small jar, but is pretty strong so you don’t need to use a lot at once. And this is what it looks like inside, close up. You can see it’s a very thick, slightly oil chile paste. Too thick to really use as a marinade, so I mixed in a few extra ingredients. To make the marinade, I combined 1/4 cup of harissa with 2 Tbsp olive oil, 1 Tbsp lemon juice, 1/2 Tbsp honey, and 1/2 tsp salt. The oil helps thin it out and the lemon and honey help dampen the heat just slightly. The honey also helps caramelize the vegetables and, which gives them a really nice deep flavor. Preheat the oven to 400ºF. Prepare a large baking sheet with a light coating of non-stick spray, or cover it with foil. Wash and cube 6 small red potatoes (about 1-1.5 lbs.). Wash and peel 3 carrots, then slice into one-inch segments. Cut one crown of broccoli into florets, and cut one small red onion into large chunks. Place all the prepared vegetables on the baking sheet. Pour the harissa marinade over the vegetables, then use your hands to toss the vegetables until they are all evenly coated. Make sure the broccoli florets get well coated, as those tend to dry out before the other vegetables. 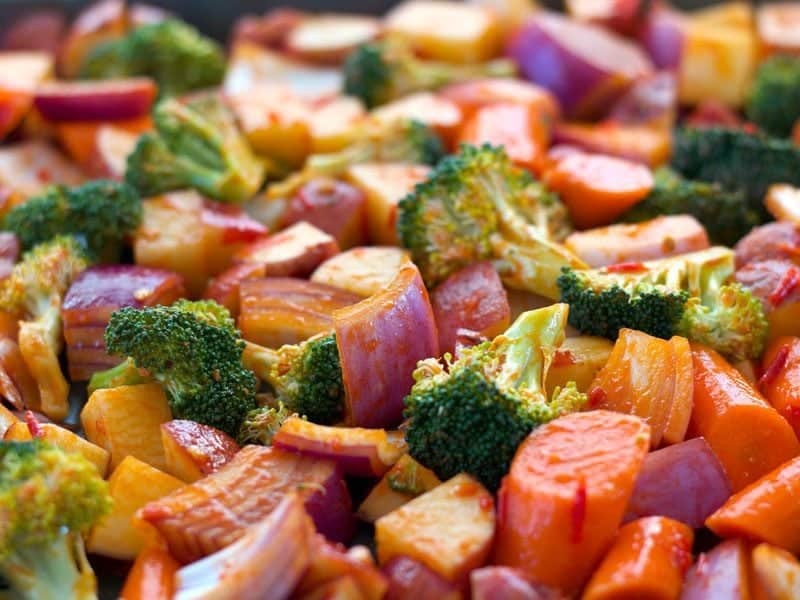 Roast the vegetables in the preheated oven for 30 minutes, give them a good stir, and then roast for an additional 10 minutes, or until the vegetables are tender and are nicely browned on the edges. Top with a handful of chopped cilantro and eat! The subtle sweetness that the vegetables acquire through roasting is the perfect balance for the heat of the harissa. I couldn’t stop eating these right off the baking sheet! 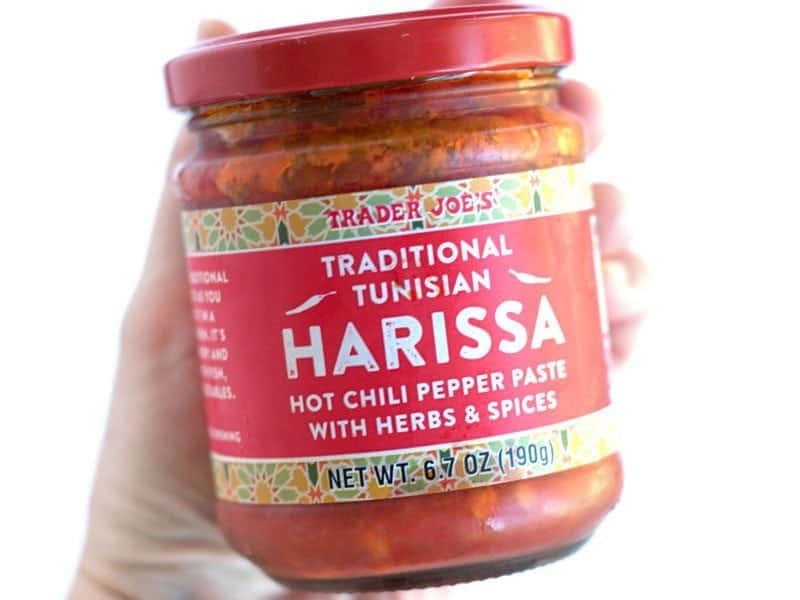 What a timely post- I just picked up a TJ jar of harissa on my last grocery trip. So far I’ve been just using it to top my hard boiled eggs and as a dipping sauce for raw veggies. I’m definitely incorporating this recipe into my menu next week! What other carbs would go well with this? I ate it with Cumin Rice, but my Yellow Jasmine Rice would also be awesome. Or you could do some nice crusty bread or rolls. Yum! Just tried these and WOW! I could eat them everyday. I already have a second batch prepped for tomorrow. So glad you have a Trader Joe’s now. Hoping to see more recipes using their products. Thank you! 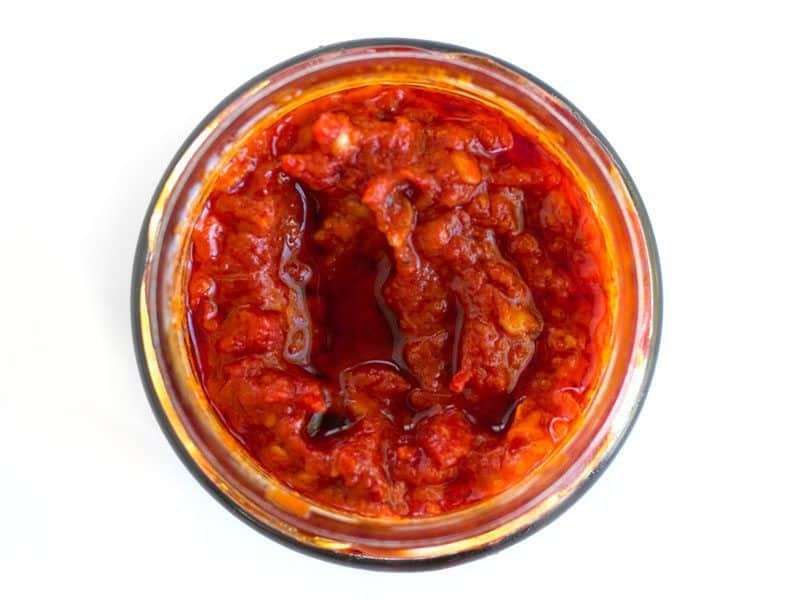 Referring back to “Dressed in Yella”s comment – what would be an appropriate amount of powder Harissa to use? I’m in Canada and Trader Joe is not nearby. Oh Beth!!! You can now experience the joys and wonders of Trader Joe’s! I flippin’ love that place! I never want to live somewhere if a TJ’s isn’t nearby. It’s pretty spicy! Once mixed into the marinade and on the vegetables, I’d say it’s still a 7 on the spicy scale. On it’s own, it’s a 10. It does remind me a lot of sambal oelek, just a slightly different flavor. I didn’t think that this dish was too spicy, but it definitely had kick. This isn’t one of those recipes that has the heat overpowering the flavor, but it is a dish with some heat. I could see some people adding a little less harissa and a little more oil to cover the veggies, but honestly I think you just for for it as is and build some tolerance because the flavor is great. Oh yum! I bet it’s great on chicken wings! So excited to try this! Fair warning, though. Harissa also is widely available as a powder. If someone ignores your lovely photos and tries a 1/4 cup of powder, it may knock their socks off (or make them very happy, depending on their spice tolerance level)! Loving your blog as always! Ahh, good point. I’ll change the ingredient list to say harissa PASTE. Thank you! First Beth, you offer so many wonderful recipes – simple, inexpensive and interesting – thank you for sharing. 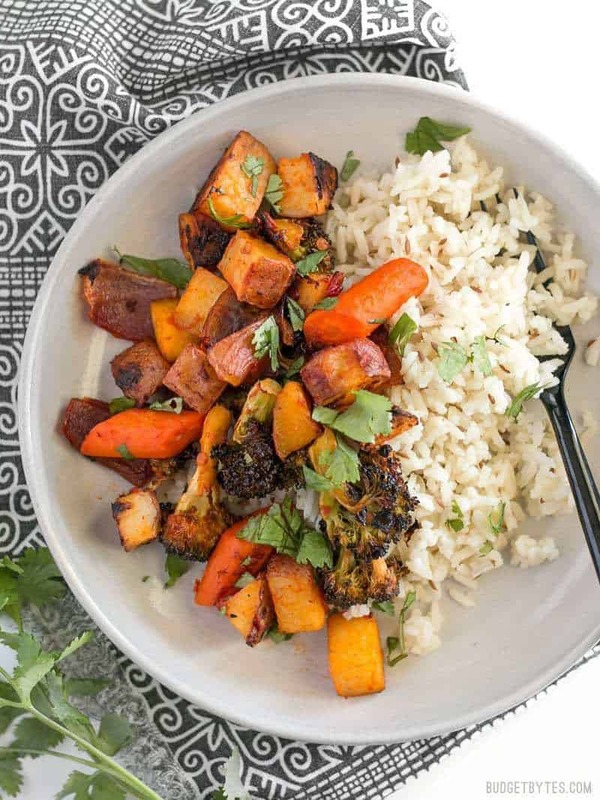 I love the look of this recipe and as I roast veges to have for breakfast, I welcome the flavor change with the Harissa Marinade which will be a nice spicy way to start the day. I also buy the Normandy frozen veges from Costco and will test it out on those. I’m so excited you’ve got a Trader Joe’s. I really love a lot of their foods and look forward to seeing recipes with TJs items. I would especially like low effort, semi-prepared recipes. One of my favorite combinations is their Masala Simmer Sauce with frozen lentils. Janet have you tried roasting the brussels sprounts with olive oil, salt pepper and garlic? My husband used to hate these veges until I made them this way. And a 350 deg. oven works well. Got to keep an eye on them so they don’t get overdone. I actually kind of enjoy the slight char that the delicate broccoli gets on the edges. :) Cutting the potatoes small, while leaving the broccoli a little bit larger helps them cook at a more similar rate, too. I also kind of like bitter flavors, but everyone likes something different, so this is probably just not the right mix for you. The color that these vegetables took on is just beautiful! This looks super tasty. Trader Joe;s has some really great finds, for sure. I’ll definitely be trying this, maybe with maple syrup or agave in place of the honey.